In a neighborhood rich with history, this unassuming penthouse located in a 19th century building embodies the definition of a "NYC GEM". Three floors totaling approximately 4,100sf along with TWO PRIVATE ROOF TOP PATIO'S totaling 800sf, creates an expansive and luxurious space perfect for entertaining or quiet nights overlooking the city. Light is an important element throughout this 3 to 4 bedroom, 4.5 bathroom home. There are multiple skylights and oversized arched windows with North, South, East & West facing views. This is the tallest building on the block allowing for one of a kind Soho views. A spacious foyer, entered from the private key-locked elevator takes you into the massive sunken living room. Anchoring the space is a fabulously designed gas fireplace and beautiful arched ceilings. An adjacent kitchen is outfitted with a La Cornue range, Miele appliances, a lava stone counter tops and a generous amount of storage space. Host the most splendid evenings in the adjacent dining room, which can accommodate up to 12 or more guests, formally. Past the entertaining areas, there is a half bathroom, a separate laundry room and additional storage space. The first bedroom located on the main floor has an en-suite bathroom, multiple closets, high- ceilings and given the separation of this suite, it is perfect as a secondary master. A glass staircase, built to perfection takes you to the second floor, which hosts the second bedroom, and enormous master suite. Both rooms are complete with walls of windows and sunshine including 8 windows in the master bedroom alone, plus 12" high ceilings. Waterworks curated the master bath fixtures and it features two sinks, a standing shower and a Hastings free standing Chelsea Silk Tub. The third floor is essentially a vacation home within a home with a beautiful library/office with walls of windows. Two private terraces are located on this floor, one on the North and the other South-facing - offering light and city views, all day long. 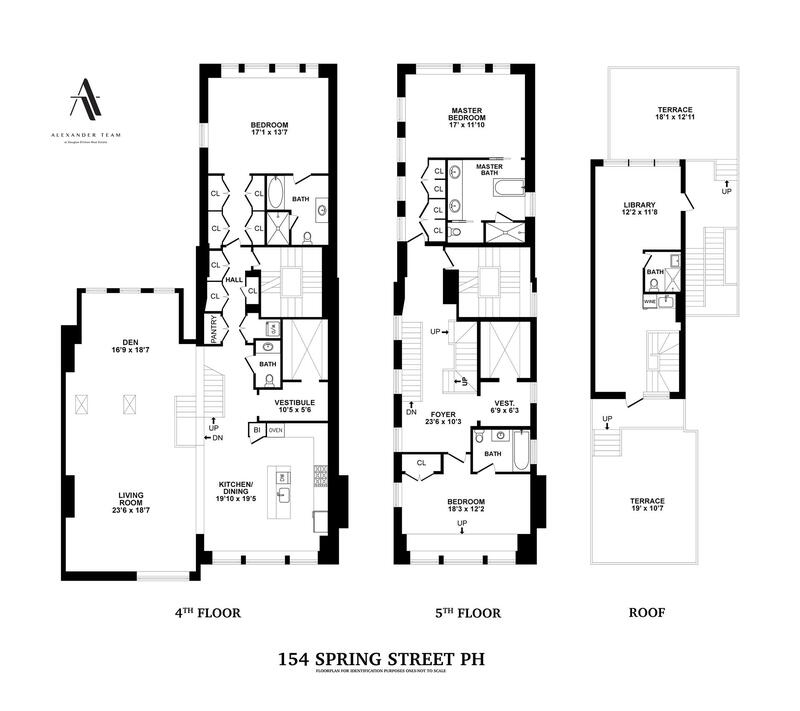 Additional tailoring of 154 Spring Street includes wide plank white oak floors, exposed brick walls, central AC and a virtual doorman system. Call us today so you can own a rare slice of New York City History.